chumbysphere forum → General Discussion → Chumby Classic? The Chumby store shows several photos of the Chumby Classic, however it is not available for purchase. Is there any chance at all it will be again? I have several classics, and I should give at least one a new home. However, I just started a new job, so wouldn't be able to mail anything until Saturday (I hope -- I might have to work Saturday). Not speaking from authority, but I bet they are all out of the squishy dudes, which is too bad because they are superior to the later ones IMO. I like my Chumby One more than my beanbag -- the volume knob, better speaker, faster processor, and USB 2.0 support are all big wins. However, the classic is also special to me, and it's what I've got on my desk at work right now. Actually, Duane has a bunch of used devices that he may start selling soon, although their firmware needs to be updated and they may need to be cleaned up visually. I think at this point, all of the new devices we put up on the store have sold out. We'll be going to the storage facility this weekend to pull out more inventory and prep them for sale. There are still a few new C8s, but everything else will be used/refurb/returns. There should be several CC units in various color combos and some C1s. I may even have a handful of I3s, though I don't know their condition. There is a single *lime green* CC - a one-of-a-kind that never went into bulk production. Not sure what to do with that one. I WANT IT!!!!!! I have a media room, painted in lime green and burnt orange! Auction to help support your efforts? ARE YOU EFFIN KIDDING ME. 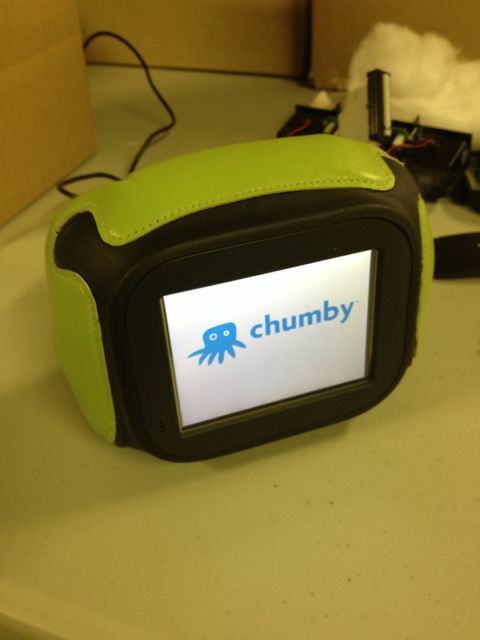 OK, so the lime green chumby is currently dead. The main motherboard in it was *very* old, not something we shipped, it died when I tried to update the firmware. On the other hand, it turns out the bezel was never glued into the housing, so it could take a module from any other CC production chumby. The "leather" (in this unit, it isn't actually leather, unlike the production units) is green but the plastics are black. I can probably dig up a black module from another device and replace the electronics. Sometimes I'm surprised hardware ever works around me... I think it's the copious sacrifices of blood that do the job. well, it *IS* used, and it *IS* fake leather... maybe Duane should let it go for the original one meeeeeelion dollarz! diamaunt suggested I post the surgery on the lime green chumby. It turned out the device had a 1.4 version of the motherboard which was a pre-production prototype, which would correspond to an Ironforge 3.4. It's no wonder the 3.7/3.8 firmware failed on it. I found a black Ironforge 3.8 that did not have its bezel glued on, apparently a device used by the Customer Service folks back in the day, and transferred the electronics. 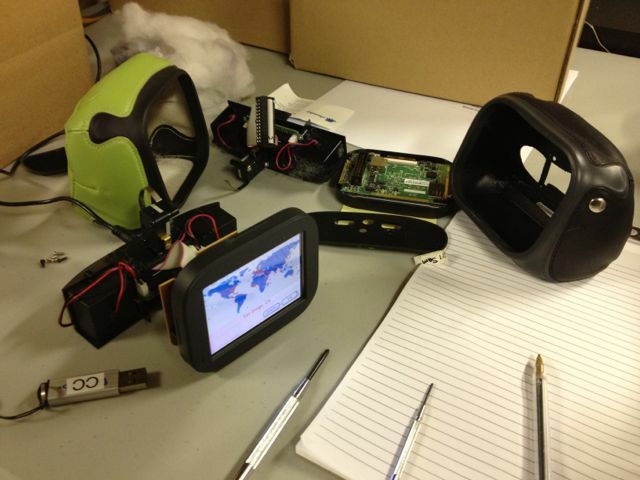 In this photo, I'm booting the electronics before inserting them into the green housing. The 3.8 device was missing a wifi dongle, so I pulled one from another parted-out unit. The device works fine but does not seem to have audio - still looking into that. It's also missing the beanbag - the one in the green unit had a hole in it (chumbarf all over the floor) and the black unit didn't have one. There's also a bit of scoring in the soft plastic in the upper right corner, which you can't see in the picture. It's actually a pretty device, though. YAY. That would match my media room, exactly!!! Holy damn, that is haaawwt.